Men in Black 3 is by no means a terrible film. (No that’s a term I’d use to describe the second film in the series). But it does seem rather pointless, and has very little of that irreverence and goofiness that made the first film so popular. What the film does offer are some super special effects, and make-up wiz Rick Baker creates a whole pantheon of first-rate aliens. It’s a pity the rest of this film doesn’t have the same inventive streak.I’m going with two out of five for director Barry Sonnenfeld’s Men in Black 3. Huge chunks of this film are convoluted and confusing, and even Will Smith looks like he’s in it just for the paycheque.Where’s that memory-erasing Neuralizer when you need it? There’s something oddly comforting about watching three great actors so earnestly embrace this schlocky cinema from a simpler, cheesier time. Smith, propelled by his own and undeniable charisma, literally leaps headlong into the one-joke premise this film is built upon, that of his cool Agent J still confounded by the inscrutability of his laconic partner, despite us all being more than used to it by now.Still, a one-joke film it undoubtedly remains.Stuhlbarg’s sincerity propels the film’s finale with some emotional heft, but the film cheats again at the very end with a conveniently rounded familial reveal that, if you think about it, fundamentally robs even the first MIB of its cool-cop cold-cop vibe. Well, the MIB gave us good comedy, great special effects, inspiring performances, and ample action. Welcome to Circa 2012 and nothing much seems to have changed. Now, for the special effects. The monster show where Smith fights it out with a huge fish that attacks diners is surely worth every penny. Sadly, it’s the 3D that does not really spruce up the drama, but once you know you are in for some real MIB-isms (a hi-tech, buddy sci-fi comedy that features everything weird, creepy, funny and wonderful in and around the universe), you don’t really care. Though more out-rightly cartoonish, it’s the same odd couple, same incredible odds and same oodles of space oddities. However, two things work for the film such as the exploration of J’s crusty and taciturn partner’s hitherto unexplored past. The other is the ever-vibrant 60’s setting which successfully induces a few laughs with the bizarre revelation that Andy Warhol was a Man in Black and J’s encounters with cops who clearly aren’t keeping abreast with the civil rights movements of the time.While Men in Black 3 isn’t a threequel of the likes of The Army of Darkness or Toy Story 3, it does surpass its predecessor. The decent performances, just-about-right pacing, and good but not mind-blowingly spectacular or imaginative special effects make the film decent enough fare to wile away an evening. Men in Black III takes off playing on this difference between the partners.There are some valuable lessons to be learnt here. Brolin is spot on as the younger Jones, for anyone interested in more time travels, that breaks in time are called “temporal fractia” whose symptoms include “a craving for chocolate milk”, and that one can put as many aliens in as many limbless, faceless, insect-crawling forms in a film, but finally what one wants more of is normal humans you can identify with..
“MIB3” is hilarious where it needs to be, it’s fast paced and it’s got action where required. And then we have the great chemistry between J and K ‘senior’ and as a bonus, we have the new added chemistry between J and K ‘junior’ (from way back in 1969). What can be better? 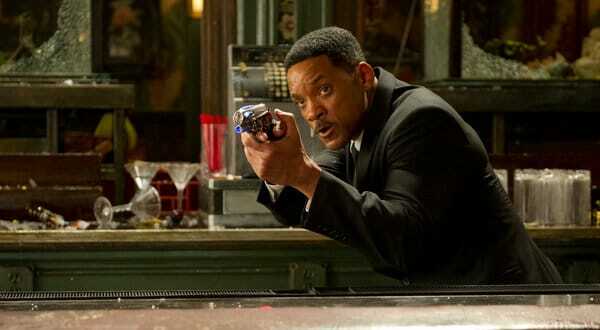 Will Smith is as fresh with his comic timing with Tommy Lee Jones as he is with Josh Brolin.An added note, the climax only adds a very touching and lovable note to the series and makes the chemistry and camaraderie between J and K even more lovable.Verdict: Like a cup of sugarfree yogurt, it is guilt-free fun. It’s got to be your weekend pick. But even as the movie carefully fulfills its blockbuster imperatives — with chases and explosions and elaborately contrived plot twists — it swerves into some marvelously silly, unexpectedly witty and genuinely fresh territory. Go figure.The first two “Men in Black” movies did some spoofing of the conventions of the black and white, cross-generational buddy picture, but the third one finds its way back to the heart of the genre. It manages, in the end, to be touching as well as hectic and whimsical, and to send a few interesting thematic bubbles into the air, having to do with lost fathers, obscure regrets and racial reconciliation. So maybe there is a reason, after all.